There are some recipes that you go back to again and again, simply because it is very simple. Some of these recipes come handy, when you have some unexpected visitors home for lunch or dinner, and you want to come up with a good spread on the table. 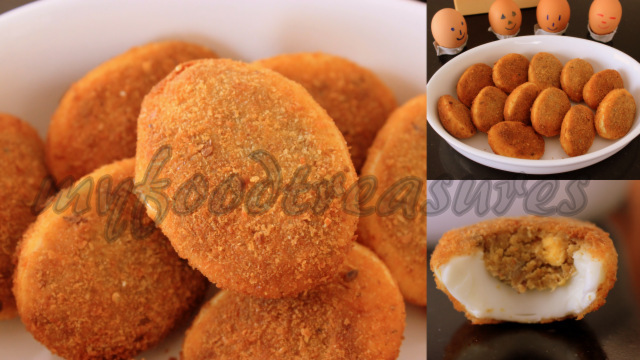 The Egg Cutlet/ Egg Fritter is one such recipe. The eggs are boiled and the yolks are pepped up with some onion, green chilly, pepper and salt, coated with bread crumbs and deep fried - quick and easy egg cutlets are ready to pop in your mouth. 1. Heat oil in a pan. Add onion, green chilly and curry leaves and stir through over medium flame until onion turns light brown in colour. Switch off flame and add salt, pepper and garam masala to taste. Let it cool. 2. Separate egg yolks and egg whites from the hard boiled eggs. Take care not to break egg whites. Mix egg yolks with onion mixture until well combined. Divide into 12 equal parts. Place each portion of egg yolk mixture back into the holes of the egg whites and press gently.You will have 12 half eggs now. 3. Dip each half egg (egg white filled with egg yolk mixture) into the beaten egg and coat with bread crumbs (just as you would do for cutlets). 4. Deep fry in hot oil until cutlets turn light brown in colour. Take care not to leave eggs in oil for too long, because hard boiled egg-whites bursts in hot oil. Drain and serve hot with tomato ketchup. Ah! I luv this fritters ...looks delicious dear.. It's wow recipe. love it very much , specially those smiley eggs. Happy 2013. This is so tempting!! I love eggs! !